MILabs B.V. provides high-end molecular imaging solutions for biomedical and pharmaceutical research. Today these systems contribute worldwide to the development of new diagnostic solutions and therapies for diseases such as diabetes, cancer, cardiac and neurodegenerative diseases. 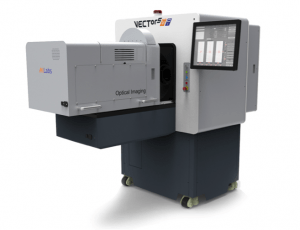 To advance their acclaimed oncology research, researchers at the Erasmus MC and Medical Delta in the Netherlands, have acquired a VECTor5OI/CT – the world’s only preclinical in-vivo imaging system with integrated morphological, functional and nuclear and optical molecular imaging capabilities. Using a single animal scan and a single anesthesia session, this unique system can acquire high-resolution CT, high-definition PET and SPECT, high-energy theranostic as well as bioluminescence and fluorescence images. The integration of these multimodal-imaging capabilities leads to improved data quality and reduces the use of animal models.